Kemper System America Inc. offers GreatSeal PE-150, a high-performance, single-component, multi-purpose joint sealant designed for long-lasting weathertight seals. According to the manufacturer, it is ideal for sealing joints in roofing, walls and masonry, as well as gaps around penetrations, flashings, windows and doors. Based on a polyether sealant, GreatSeal PE-150 contains no solvents and very low VOCs. The multi-purpose indoor/outdoor sealant exhibits excellent weathering properties with a service range of 200oF to minus 40oF (93oC to minus 40oC), movement capability of +/- 25 percent, and zero shrinkage. According to the company, the product adheres even on damp surfaces. It can be applied in cold weather, and in most cases, without a primer. It bonds aggressively to most building materials, including wood, vinyl, glass, fiberglass, foam insulation, asphalt, modified bitumen, EPDM, PVC, PIB rubber, and Kynar coatings, as well as painted, galvanized and anodized metals. GreatSeal PE-150 is part of a family of construction sealants from Kemper System. The GreatSeal brand also includes GreatSeal LF-500 Liquid Flashing compatible with Roof Guardian elastomer-based roofing products, and GreatSeal LT-100 polyether Liquid Tape compatible with Wall Guardian FW-100A, a liquid-applied fibered acrylic air barrier. All three brands are in the STS Coatings line, acquired by Kemper System America in 2016. Kemper System America Inc. has named Lynn Walters as the company’s West Coast Regional Sales Manager. In the role, Walters will have responsibility for expanding sales and educating architects, consultants and contractors across the region about the company’s range of barrier solutions for the building envelope. Based in the San Francisco area, he joins the company from STS Coatings Inc., acquired by Kemper System last year, and he brings more than two decades of sales and marketing experience to his new role. Walters currently serves on the board of directors of the Reflective Insulation Manufacturers Association (RIMA), and as committee chair for the Strategic Alliance for the Air Barrier Association of America (ABAA). He is also a member of the Cool Roof Rating Council, RCI Inc. and ASTM International. At STS Coatings, Walters served nine years as National Sales Manager, and also as Product Manager representing HeatBloc-ULTA radiant heat barrier. Previously, he spent 12 years as West Coast Sales Manager for the OEM Building Products Division of BASF. 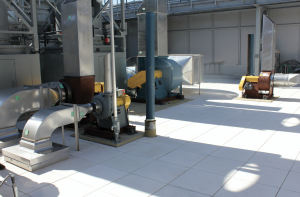 The rooftop on the Belfer Medical Research Building not only houses HVAC equipment but serves as a rainwater detention system. 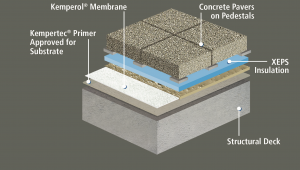 The reinforced membrane waterproofing system by Kemper System was applied to the roof deck before the pavers were put in place on a pedestal system. The Belfer Medical Research Building on the campus of New York’s Weill Cornell Medical College was designed to be a 19-story model of eco-social construction. Designed by Todd Schliemann of Ennead Architects, the building showcases a number of sustainability features, including a storm water detention system on the roof. Built for a cost of more than $630 million, the tower includes 13 stories of research laboratories. The tower has three roof levels at the 17th, 18th and 19th floors. The rainwater detention system, known as a “blue roof,” not only helps regulate storm water discharge, but it feeds a water fountain and irrigates planters on the second-floor terrace. In general, rainwater detention systems can either collect water in holding tanks and then meter it to the public sewer system, or retain it on a waterproofed roof expanse. The blue roof on the Belfer Research Building uses the latter strategy. It complies with New York City requirements and can hold up to 3 inches of water. Proper waterproofing on the project is essential. The solvent-free and odor-free KEMPEROL 2K-PUR cold, liquid-applied membrane system was used for waterproofing the blue roof. It was also used on the terrace and fountains on the lower level. The reinforced membrane system is designed for long service life and backed by an extended-wear warranty. Eagle One Roofing Contractors Inc. of Astoria, N.Y., a certified applicator of the Kemper System, applied the waterproofing system. The two-part resin system is designed to fully adhere to the substrate, and is fully reinforced with fleece. The resulting membrane is completely seamless and unaffected by ponding water and ice. According to the manufacturer, it resists exposure to UV light, chemicals, oils and solvents. It is impervious to bio-deterioration and is both root- and rot-resistant, so it is also ideal for green roofs and landscaped areas. The supporting structure below the roof was designed to carry the water load, with an allowance for heavy snow or ice buildup. The roof deck is concrete slab and includes a layer of rigid insulation below the waterproofing membrane for added energy efficiency. The gravity-fed drainage system was carefully sized to control the speed of drainage without the use of pumps, sometimes required for rainwater detention systems that use holding tanks. On the roof sections, the waterproofing sections were topped with concrete pavers on a pedestal system. Construction at the Weill Cornell Medical College, both interior renovations and new construction, is designed to meet a minimum LEED Silver status. This project was designed to achieve Gold certification, the nationally accepted benchmark for the design, construction and operation of high-performance green buildings. This illustration shows the assembly used for the blue roof on this project. The cold, liquid-applied reinforced membrane system was topped by concrete pavers. Image: Kemper System America Inc.
On the south side of the building, Ennead created a double-skinned, fritted glass curtain wall with openings and sun-shading devices that absorb the sun’s heat before it gets trapped inside, which would require the HVAC system to pump out more cold air. Continuous ribbon windows flood the building with natural light, and energy-efficient HVAC, lighting controls and water-conservation systems save on power and resources. The building’s green infrastructure is expected to shrink Weill Cornell’s energy bill for it by about 30 percent and reduce carbon dioxide emissions by about 26 percent compared to a building complying with the minimum requirements set by typical industry guidelines and standards. The building includes a high-tech, multi-zoned HVAC control system to manage the indoor environment within different spaces. Biomedical laboratories, for example, generally require special air filtration systems supported by high-volume air circulation. Each of the laboratory levels includes four fume vents to the outside, except for the chemistry laboratory on the top floor, which uses 40 vents. In addition to thermostats and humidity sensors, indoor spaces utilize occupancy sensors to assist in regulating the ambient indoor environment and lighting to improve energy efficiency. Eagle One Roofing Contractors, Inc., Astoria, N.Y.
Kemper System America Inc., West Seneca, N.Y.
KEMPEROL Roofpatch is a ready-to-use patch kit from Kemper System America Inc., West Seneca, N.Y.
KEMPEROL Roofpatch is a ready-to-use patch kit from Kemper System America Inc., West Seneca, N.Y. Kemper System invented cold, liquid-applied, reinforced waterproofing technology more than 50 years ago, and the Roofpatch kit offers the company’s technology as a quick solution to reliably stop leaks and cover cracks and damaged areas. The kit’s flat aluminum packaging includes rubber gloves and a reinforcement fleece pre-saturated in a single-component, solvent-free and odor-free KEMPEROL 1K-SF waterproofing resin. 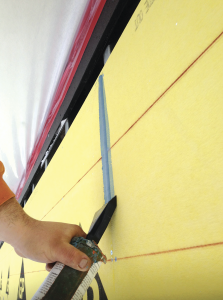 The reinforced membrane is pre-cut to approximately 10 by 18 inches; a single patch can handle most repairs. Patches also can be overlapped to cover larger areas. The reinforced membrane is pre-cut to approximately 10 by 18 inches; a single patch can handle most repairs. The multipurpose patch adheres tightly without a primer to bitumen sheets, PVC roofing, concrete, wood and metal. The resin is rainproof in 60 minutes and can be walked on after 12 hours. The kit’s flat aluminum packaging includes rubber gloves and a reinforcement fleece pre-saturated in a single-component, solvent-free and odor-free KEMPEROL 1K-SF waterproofing resin. Developed in Germany, the UV-stable Roofpatch was introduced in the U.S. a year and a half ago. It currently is available nationwide through select distributors of building products. It also can be purchased via Kemper System America’s online store, which can be accessed through its website. Watch the Roofpatch demonstration video. The inaugural “Roofers’ Choice” was determined by the product that received the most reader inquiries from the January/February issue’s “Materials & Gadgets” section. PHOTOS: Kemper System America Inc.